You know when something is troubling you, and it isn't the thing that is really troubling you? Like when you imagine punching the stranger who stands too close to you in a line? It's not them that you really want to punch. It's the idiot spouse/boss/parent/friend who let you down, lied, tore your shirt - whatever - you know what I mean. Well recently I have been finding myself more vulnerable over the smallest of things and tonight I just asked myself; am I really this upset (and I mean snot and tears and no sleep despite sleeping pills) just because of something someone said? No - here is what I am really upset about....and this takes courage for me to share. Along with millions of others, I was deeply saddened yesterday upon hearing the news of three bombs during the Boston marathon. 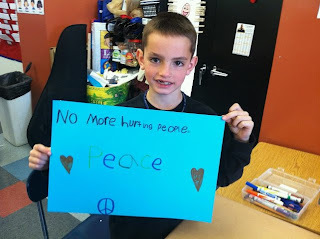 This evening, through Facebook, I saw the photograph of Martin Richard holding a handwritten sign that states: "No more hurting people. Peace." He was the eight year old victim who was waiting for his Dad to pass that finish line. I am stunned when I read things like this. My heart sank and then I felt it open even wider. At the time of the first explosion, 2:50pm, I had sent an email to a friend. I had in fact titled it 2:50pm. Life is that small. Yet actions are so incredibly wide and varied. At 2:50pm you have my tiny act of friendship and at the same time a heartless act of terrorism.